DigitalOcean Spaces public and private Spaces can be used as origins with Fastly. To make your DigitalOcean Spaces available through Fastly, follow the steps below. In the Address field, type nyc3.digitaloceanspaces.com. When DigitalOcean releases new regions, you can update the address here. In the Transport Layer Security (TLS) area, type nyc3.digitaloceanspaces.com in the Certificate hostname field. Type the hostname of your Space. For example, <yourspace>.nyc3.digitaloceanspaces.com. In this example, no cache control headers are set so default TTL will be applied. To use a private DigitalOcean Space with Fastly, follow the instructions below. Be sure you've already made your Spaces data available to Fastly by pointing to the right Space and setting your origin to port 443. This needs to be done before authenticating. 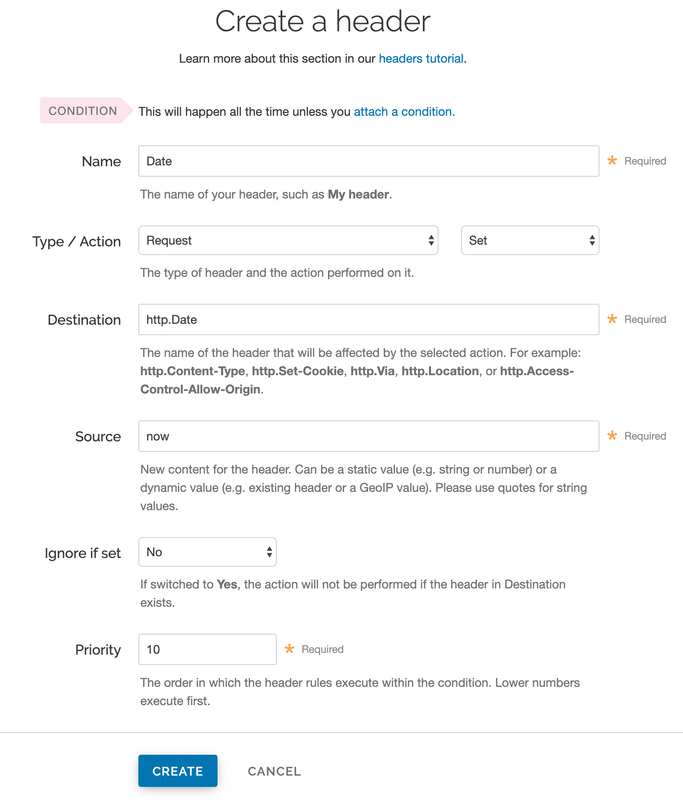 In order to use a private DigitalOcean Space with Fastly, create two headers, a Date header (for use with the authorization Signature) and an Authorization header. In the Name field, type Spaces Authorization. access key The access key from your DigitalOcean account. We used JKCAUEFV2ONFFOFMSSLA in this example. key The secret key from your DigitalOcean account. We used P2WPSu68BfI89j72vT+bXYZB7SjIOwhT4whqt27 in this example. /n A newline indicator constant. It's always /n. CanonicalizedAmzHeader The x-amz headers, which customize your Spaces implementation. It's often left blank. We use LF in this example. CanonicalizedResource Your DigitalOcean Space name. We use "/test123" in this example. With custom VCL, Fastly can follow redirects to Spaces objects and cache the Spaces response as well as the 301 or 302 response separately. Be sure to read our instructions about mixing and matching Fastly VCL with custom VCL. It's important to include the entire VCL boilerplate if you do not intend to override the Fastly default settings. Be sure to set the Main_Origin and spaces_backend to the actual name of your backends in the service to which you're applying these redirects. You can find the exact names by reviewing your VCL. Simply click on the VCL button at the top of the page while viewing the service. Once you added these VCL snippets to your custom VCL, upload the VCL file and then activate the new version of your service to apply the changes.